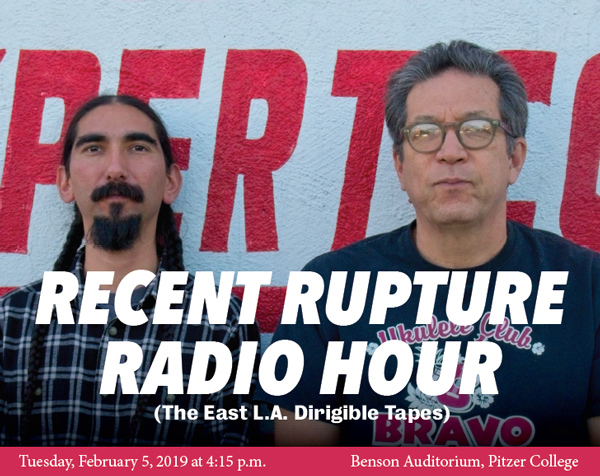 Claremont, Calif. (January 18, 2019)—Poet Sesshu Foster and artist Arturo Ernesto Romo will discuss artistic collaboration, living an independent artist’s life and the role of arts in community building in their talk “Recent Rupture Radio Hour (The East L.A. Dirigible Tapes)” at Pitzer College on February 5. Foster and Romo are Pitzer’s 2019 Murray Pepper and Vicki Reynolds Pepper Distinguished Visiting Artists. Longtime collaborators, Foster and Romo created the forthcoming novel East Los Angeles Dirigible Air Transport Lines and the ELA Guide, a website outlining driving and walking tours of East Los Angeles. Drawing on their explorations in East LA, they produced the Recent Rupture Radio Hour, a series of fake radio shows. A writer, teacher and community activist, Foster was born in East LA and has been called “the poet laureate of a vanishing neighborhood.” Foster, who earned his MFA from the Iowa Writers’ Workshop, has taught composition and literature in East LA for 30 years. His collections of poetry and fiction include World Ball Notebook, which won an American Book Award and an Asian American Literary Award for Poetry. Romo creates collaborative mixed media artwork as well as drawings and murals. His artwork draws on his explorations on the streets of Los Angeles and is influenced by “conspiracy theory and alchemical texts, junkyards, sprawl architecture, terrorism and entheogenics,” according to Joyland Magazine. The annual Pepper Distinguished Visiting Artist Lecture is made possible by the Murray Pepper and Vicki Reynolds Pepper Distinguished Visiting Artists and Scholars Endowed Fund at Pitzer College. Established in 2007, the fund helps bring critically acclaimed artists and scholars to campus to hold seminars, workshops, public talks and one-on-one conversations with students. The fund is named after Trustee Emeritus Murray Pepper and Vicki Reynolds Pepper, long-term supporters of the College and the grandparents of Pitzer alumni David Pepper ’17 and Morgan Pepper ’12. The 2019 Murray Pepper and Vicki Reynolds Pepper Distinguished Visiting Artist Lecture will be held on Tuesday, February 5, at 4:15 p.m. in Pitzer’s Benson Auditorium. For more information email pitzer_galleries@pitzer.edu or visit the Pitzer College Event Calendar. The Pitzer College Art Galleries’ mandate is Education and Advocacy through the Pitzer College core values—social responsibility, intercultural understanding, interdisciplinary learning, student engagement, and environmental sustainability. By following these precepts, Pitzer College Art Galleries engage and interrogate contemporary and historical issues of importance to expand our audiences’ understanding and contribution to our artistic, intellectual, and social culture. Through curatorial creativity and innovative programming, the Galleries seek to provide context, support, and a critical framework for artists and curators working today and, by doing so, inspire meaningful dialogue that fascinates, excites, and invigorates. For more information, please visit www.pitzer.edu/galleries.